Te board of missouri first is proud to announce the winners of the statewide essay contest. The First Place winner is Rowena Mosher, a homeschooler from Rolla, MO. Miss Mosher has been awarded a prize of $1,000. The Missouri First board presented the first place award on September 28 in Rolla, MO. Senator Sarah Steelman, Miss Mosher's state senator, was present to award the prize. 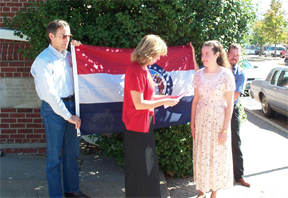 Missouri First's essay contest was open to all missouri residents 14 through 17 years of age. Essays were separated from their identifying information before being read by a panel of judges [made up of the board of missouri first in order to prevent any bias in the judging as pertains to gender, knowledge of or aquaintanceship with the writer's parents, or educational options. The second place essay was written by Amy stubblefield from Aurora High School in Aurora, MO. Third place goes to Evangeline Day, a homeschooler from Dixon, MO. The second and third place winners each get a $50 check from Missouri First, and all three winners get a Missouri flag. "It was the best of times; it was the worst of times." These words from a novel of Charles Dickens aptly describe the history of Missouri. From the time the first pioneers pushed eagerly into Missouri, the rolling hills and broad plains they settled have held a curious mixture of blessing and curse. When Daniel Boone led his parties of determined men and loyal wives through deep ravines and gushing rivers, did they know that they had just enlisted in a desperate fight for survival? If they had not known it before, they soon learned. The only greeting they received was from antagonistic Indians, bears, rattlesnakes, and an overwhelming number of bugs. They were surrounded by the dense woods and rocky hillsides in which they were soon to suffer floods, earthquakes, blistering heat, freezing cold, tornadoes, and epidemics. What could possibly result from their venture? Death. Suffering. New lines of care on each face, even those of innocent children. Yet somehow this was not what these brave souls saw when they looked at Missouri. They saw beautiful hills, abundant waters, bountiful wild game, rich river bottoms, and endless trees against the bright blue sky. The settlers were German, French, Irish, and Italian. They were as diverse as their backgrounds and faiths. But they were bound together by the common goal of conquering and prospering in the land they had chosen. In places such as St. Louis, the beckoning Gateway to the West, civilization had had time to grow and flourish. Yet the depths of the state remained untouched. The failures of farm after farm made poverty a common condition. Children were not properly clothed or educated--it took all of their parents' resources to merely feed and shelter them. As settlers spread throughout the entire Midwestern region, many people gave up on Missouri. After all, they thought, what was the use of laboring for hours on the rocky red clay of Missouri when the rich dirt of Kansas and Oklahoma called? Those who dug in and stayed began adapting. Farming could not be depended upon to completely provide for a family, so they expanded to hunting and trapping. Thousands of fur pelts traveled from Missouri to Eastern states, where people had money for such things. Unobserved blessings began to develop out of the struggle. Families worked together to remain self-sufficient, giving them unlimited time to grow close and strong. Their poverty forced them to be creative, frugal, and self-reliant. Their sacrifices led them to appreciate the sacrifices of others and so they became dedicated patriots, committed to a system of government that did not intrude upon them. On Sundays whole towns could be found in the humble churches of Missouri, seeking the God Who sustained them. Their beliefs led them to be close-knit communities full of integrity and values and generous in charitable pursuits. Some may think of Missourians as uneducated "hillbillies", left behind by technology. However, Missouri has turned out some of the most influential and famous men of the United States; men such as Harry Truman, Omar Bradley, John J. Pershing, and George Washington Carver. Many of those tenacious first Missourians developed a God-fearing work ethic so deep and so effective that it was bound to build great men. Those qualities and those people have made Missouri a beautiful and successful state. I am proud to say my ancestors settled in the Missouri Ozarks over one hundred years ago. I am proud to say they came, persevered, and conquered! They may not have all been rich or famous, but they left each one of us a legacy of what a man can accomplish with the strength God provides. I am proud to be a Missourian! Copyright 2001 Missouri First, Inc.